From the delightful looking Misty of day four, to the rather alien and dodgy looking Marsha on Day five! Don’t be fooled by her scary looking head fins and weird tentacles, she is actually rather a friendly little blob. It is just that the radioactive waste, it is rumoured, that is pumped into the Slack Lagoon has created these rather gloopy little critters. Her bug-eyes hide a heart of gold, and she is more than happy to have a wee chat with anyone that isn’t too scared to stop and natter with her and her fellow boggy swamplings. Bring her some dead gutterflies and she is going to be your friend for life! You might be fooled into thinking that Marsha was from another world, but them the radioactive gloop that has created her and her friends wasn’t going to give you a creature you could take home to your mum now was it? 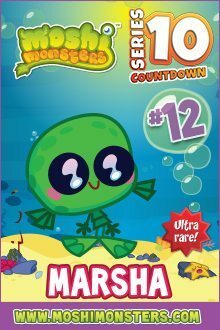 Because Marsha is Ultra Rare, we even have an introductory video from Chatterbox for you! Join us tomorrow for day six of our countdown when I promise to bring you even more lovely moshling tales…who will it be? If you can spare a moment, we would love you to subscribe to our newsletter too below. More Moshilings, giveaways and charts await you!